Son of Gutman Wolf (No. 3). He graduated from the University of Giessen in 1729; died 1743. Born at Frankfort 1645; died June 26, 1715. He devoted many years to the study of medicine and philosophy at the universities of Heidelberg, Vienna, Pisa, and Padua, and graduated from the last-named in 1669. 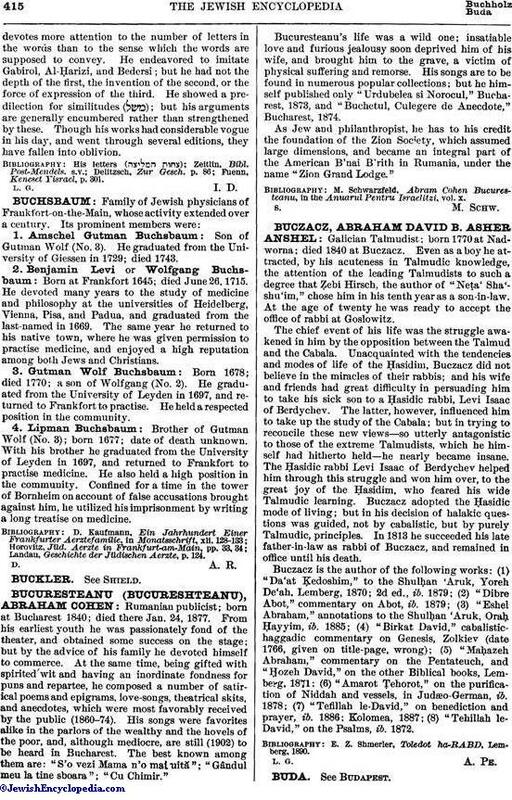 The same year he returned to his native town, where he was given permission to practise medicine, and enjoyed a high reputation among both Jews and Christians. Born 1678; died 1770; a son of Wolfgang (No. 2). He graduated from the University of Leyden in 1697, and returned to Frankfort to practise. He held a respected position in the community. Brother of Gutman Wolf (No. 3); born 1677; date of death unknown. With his brother he graduated from the University of Leyden in 1697, and returned to Frankfort to practise medicine. He also held a high position in the community. Confined for a time in the tower of Bornheim on account of false accusations brought against him, he utilized his imprisonment by writing a long treatise on medicine. Landau, Geschichte der Jüdischen Aerzte, p. 124.